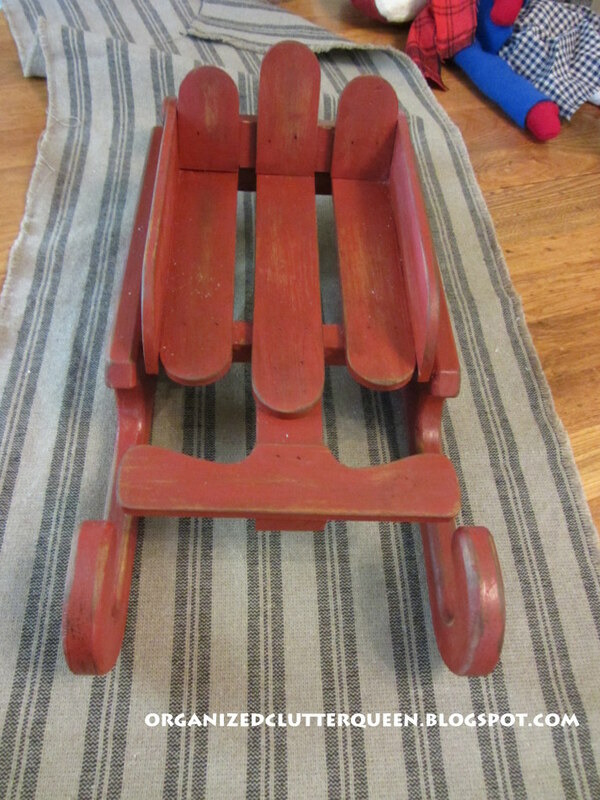 I just picked up this cute little country-look pine sled last week thrifting for $3. 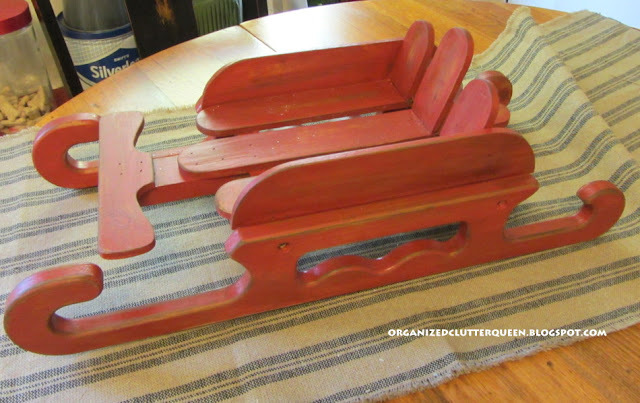 But with a couple coats of Rustoleum American Accents Colonial Red, a little distressing and a little rubbed on walnut stain, I have an updated little Christmas sled. Still country, but that's okay. Nothing homier than a country Christmas. No, I'm not jumping the gun...just playing with the new sled...(but the temperature did get down to 16 degrees last night here in Minnesota). Sooo cute! Love the color you painted the sled and great price!The little snow mom and baby are perfect with it. I can't believe you had 16 deg. last night. Yikes! Get out the long johns. What will it be in dead of winter? I love your red sled! It's amazing what a little paint can do, wonderful find! Wow you guys got cold fast. We were saying burrr yesterday at 68. We are wimps. Anyway that is the cutest little sled and how perfect your re-do of it. Love how you aged it. Did you use a glaze? Wow it has gotten cool there. We have had a couple nights in the low 30's. I wanted to paint some things outdoors today but it felt too chilly. We all need a little country. Carlene that sled is adorable in Red!! I'm not ready for Christmas but it is starting to 'sneak' into my thoughts. 16 degrees?? Brrr. That really sounds cold - no wonder you're thinking about Christmas! Love the little red sled. Really cute. Love the sled...so cute!! I agree...nothing homier than a Country Christmas. Cute little sled! I love the red, and you're right about the temps. It's beginning to FEEL a lot like Christmas! That red is the perfect shade and what a great little decorative item to have on hand. Hard to believe it's so cold there. We did finally get a sense it was Fall here the past two days. We've awakened to temps in the 70's that make it feel as if there is almost a sense of cool on the breeze. Still a high of 84, but funny how cool the low 80's feel when it's been 90 or more otherwise. I can't imagine 16 degrees, let alone right now. Bundle up! Dang! It hasn't gotten that cold here yet! Love that little sled, definitely better in red! Great buy! 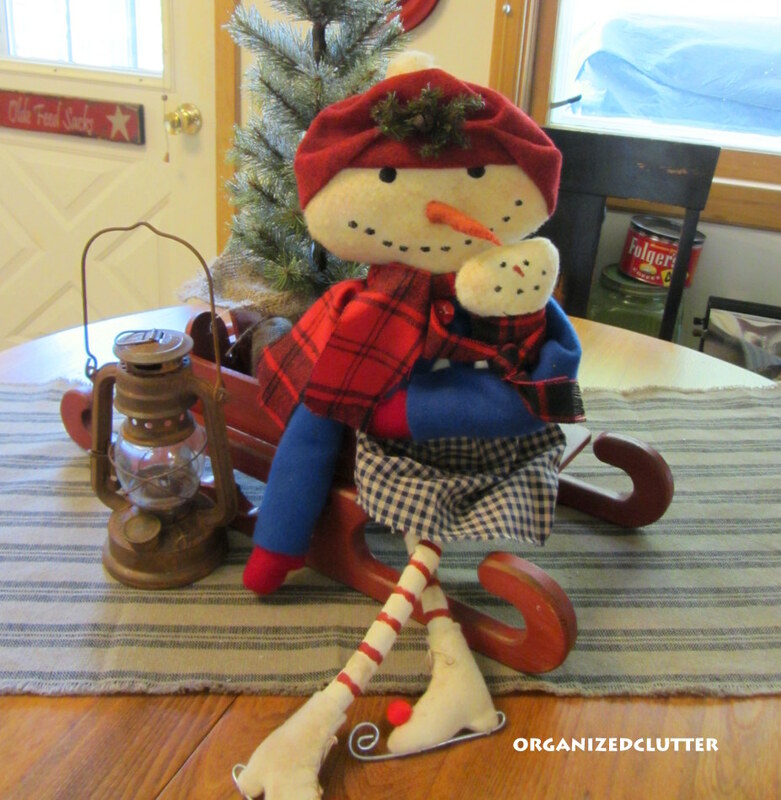 It's hard for me to believe Christmas is almost here! What a great find! I love the color you painted it and how you gave it a distressed look. Cute! That little sled is just too cute Carlene. Thanks for sharing. I am totally late on your Nostalgia posts! I am looking back on everything from Oct. I used to decorate my house with Primitive/Country decor. So, a lot of what I have is still country. But, you are totally right. There is nothing homier than a country Christmas. Especially since we live in the country! By the way, great job on this sleigh! So sweet!